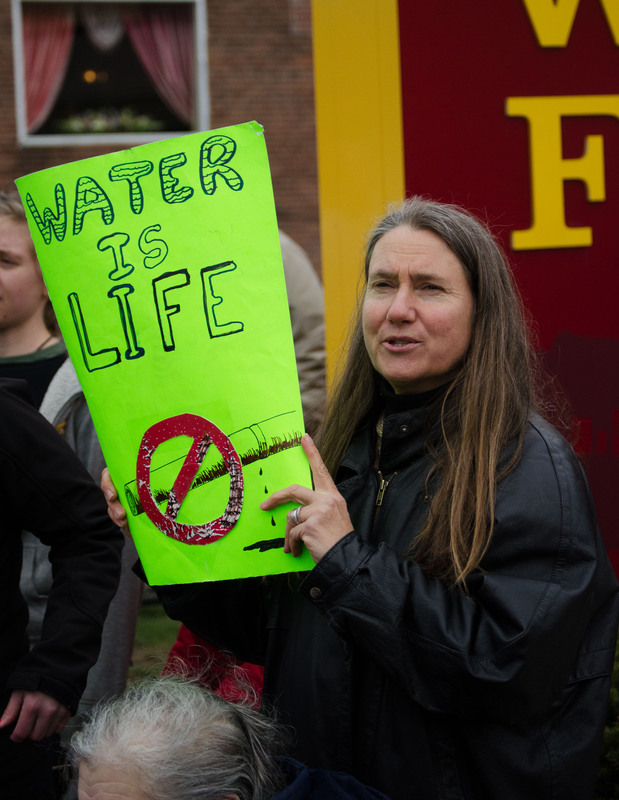 On Friday, University students joined forces with local residents to protest at the Middletown Wells Fargo branch with the objective of getting Wells Fargo to stop funding the Dakota Access Pipeline (DAPL) project. According to the Facebook event, the project threatens the land, water, and sovereignty of the Standing Rock Sioux and surrounding indigenous communities in North Dakota. Angel Martin ’19 was one of the many people at the protest. As a member of both the Wesleyan Coalition for Divestment and Transparency and Wesleyan Students Against the Fossil Fuel Industry, Martin helped spread the word about the protest after the two groups she is a part of were contacted by the Dragonfly Climate Collective. Martin took part in the protest for a number of reasons, including her desire to show solidarity with water protectors resisting DAPL and to support indigenous sovereignty and native lives. The protest even drew residents from surrounding towns. Sandra Olsen came from Haddam Neck, hoping that her participation would help different establishments with money invested in the oil industry realize the importance of a renewable future. She pointed out that though a renewable future would require subsidies, our present situation does too. Collectively, the group of students and residents managed to disrupt business at the branch between 3:30 and 5:00 p.m. The branch was actually shut down early as a result of the protest, and the message of the protest was certainly spread to those driving by the bank. One of the more prominent parts of the protest was 77-year-old Vic Lancia, who blocked the entrance to the bank starting around 3 p.m. with his body. He sat on the sidewalk directly in front of the door with his arms inside tubes within two garbage bins filled with sand and large rocks. When asked about his predicament, Lancia said that though his hands were locked in the trashcans, he could unlock them from the inside. A student brought over a microphone for Lancia to speak into, and he delivered, talking about how the current administration is trying to destroy the Environmental Protection Agency. Lancia commented on how he found out about the protest. Despite the success of Friday’s protest, demonstrators believe this is one step of many that need to be taken in order to get companies like Wells Fargo to stop funding DAPL and to raise awareness for the harm being done inflicted upon the environment. Glad these folks are protesting. Next step would be for them to divest, if they haven’t already. 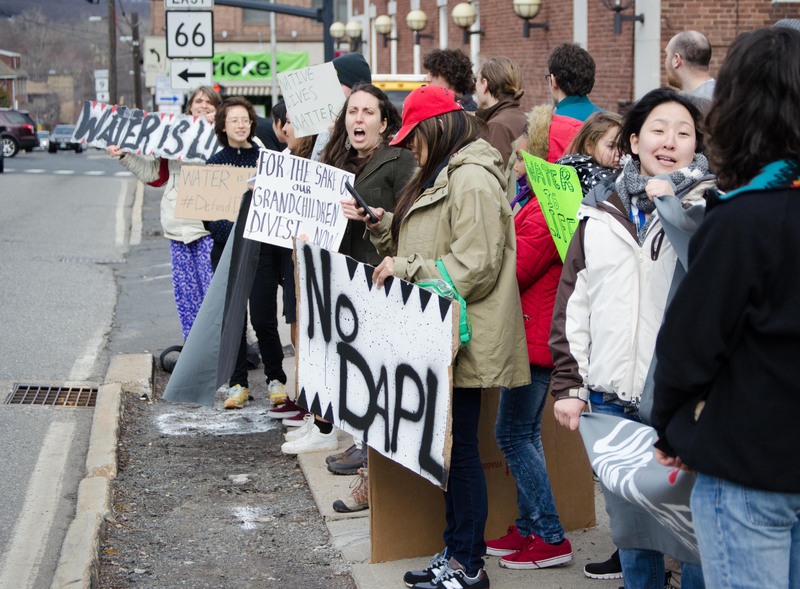 Students who have local accounts at Citizens Bank or Bank of America, which each fund DAPL, may want to close those accounts and open up credit union accounts in their hometowns or even in Middletown (Dutch Point Credit Union is near the Red & Black Cafe and opens membership to people going to school in Middlesex county).